If you have 15 minutes (plus a few more to warm up), you have time to work out! This interval workout will do the trick. The key to killing it on a workout like this is going hard from the get-go. That’s why you want to take at least a few minutes to warm up and get a sweat rolling first. Once the workout starts, it’s on! Take breaks as needed but you’re aiming to get breathless. “Work until you can’t, rest until you can,” is your guiding phrase. You can use the rowing machine, SkiErg or BikeErg, or a combination of the three. Just make sure you’re breathing hard on those pieces, as well as on the off-erg exercises. If you’re rowing on a Concept2 machine, use the Undefined Rest feature to make working through the rounds a breeze. Lunges/squats: The squats are an option for “scaling,” or making the workout a bit easier (or simply giving an option for a different move if, for example, lunges don’t work for you). OH press: Overhead press. You can use dumbbells, kettlebells or a barbell. Aim to push the weight above your head, until your arms are straight and even with your ears. Questions? let us know in the comments. 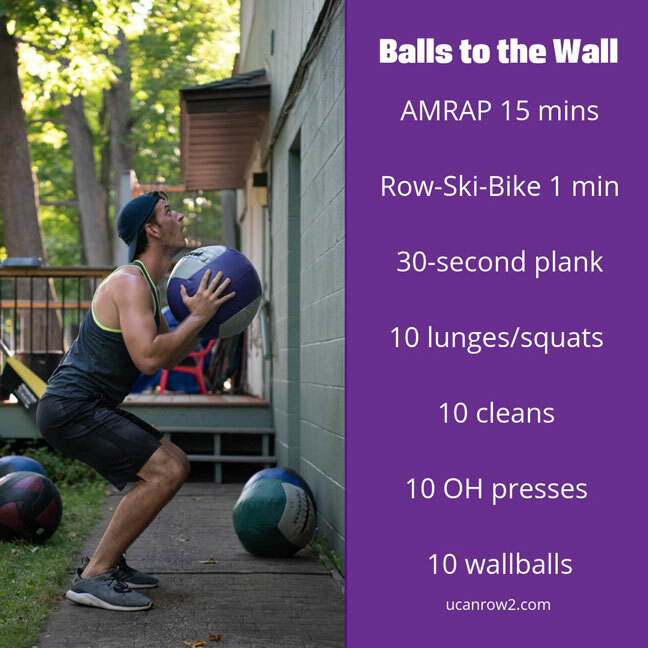 If you try the workout we’d LOVE to hear your feedback, too!